Home DIY Projects	Bridal Shower Party Favors! Greetings, Friends! Recently I shared with you the bridal shower my sisters and I hosted over the weekend for our niece. The theme was a Chandelier Bridal Shower so naturally the party favors needed to follow suit. 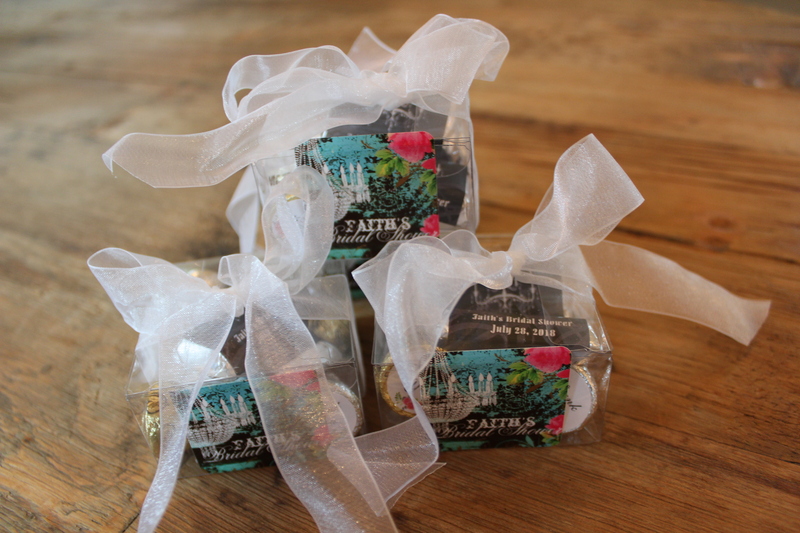 Come check out the chandelier bridal shower party favors! The party favors further emphasized our chandelier theme! We made our own party favors using boxes I found at Michael’s about a year ago. The clear plastic boxes came in a pack of 50 and had translucent white ribbon attached to the bottom and were around $20. We sent out about 42 invitations so 50 was the perfect number to shoot for. It’s a good thing because about 8 of the boxes were duds and broke during assembly. The boxes I used are no longer available (probably for obvious reasons) The boxes were by His and Hers and didn’t come with instructions making it tricky to put them together. I love how they turned out but I admit they were a pain to assemble. We ended up adding a piece of clear packing tape in the bottom of each box to hold them together. The finished boxes measure about 1 ½” by 2 ½” and were each able to hold 2 miniature Hershey candy bars, 3 Hershey Kisses and 3 individually wrapped white mints. We filled the boxes and tied the ribbons on top. We added the final crowning touch, a chandelier sticker which said, “Faith’s Bridal Shower”. We aligned the bottom edge of the sticker with the bottom edge of the box and used the small top part of the sticker to seal the top flap of the box. Again, I found the stickers on Zazzle.com. I searched for “chandelier stickers” and this is one of many designs to choose from. This style is called “GC Shabby Aqua Garden Chandelier Square Sticker” and are 1 ½” square. They come in a sheet of 20 and were $4.21 per sheet. (plus taxes and shipping) We had extras so we stuck them on plastic cocktail cups for an added decorative touch. Didn’t they turn out sweet? And about 40ish boxes later, we stacked them on a silver serving tray and placed it on the kitchen island with the other decorations. Each of the guests took home one of the favors and I gave the rest to Faith Elizabeth so she could share with her friends that were unable to attend the bridal shower. The boxes I used are no longer available, but I found similar ones on Amazon: They are David Tutera Flocked Swirl Favor Boxes with Ribbon, White-24 pack for around $10. (See the link below for the boxes.) And, they look much more substantial. Next time I’ll use these. Plus, it looks like a 1 ½” sticker would fit perfectly on the front of the box. These would make great wedding favors too! The sky is the limit when it comes to party favors. I can’t wait to see what Faith Elizabeth chooses for her wedding reception favors! So many details go into a wedding, right? We had so much fun planning the festivities for my son’s wedding last year and this year we have another!